Chardonnay is the basis of some of the world’s most iconic wines and its success is underpinned by a historic program of clonal selection. With numerous clones available showing differences in key viticultural and oenological traits, the potential diversity of Chardonnay wines and blends has never been greater. Despite this, the genetic variation that underlies most of these differences has, for a long time, remained a mystery. The AWRI, in collaboration with partners at Macquarie University, the University of British Columbia, and the British Columbia Cancer Research Centre, spearheaded an ambitious project to produce a high-quality genome assembly for Chardonnay and use this to unravel the great puzzle that is clonal genetic diversity. The AWRI’s bioinformatics team identified 1,620 genetic markers that distinguish 15 Chardonnay clones. 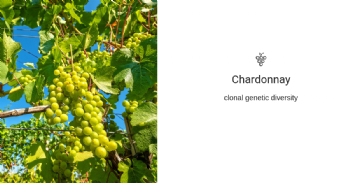 These markers were used in a proof-of-concept experiment to reliably identify Chardonnay clones, and many of the markers were identified as having the potential genetics to explain some of the differences between clones. The most surprising finding however involved the genetic analysis of Chardonnay’s parents—Pinot Noir and Gouais Blanc. While Chardonnay might be a noble cultivar, it has a less than dignified heritage. The genomic data shows evidence of inbreeding – with Gouais Blanc and Pinot Noir potentially being first-degree relatives. More work is required to develop a method for Chardonnay clonal authenticity testing, as well as testing to determine the viticultural and oenological effects of the markers. However, the groundwork has been laid for a much better understanding of the Chardonnay genome, and of clonal variation within grapevine cultivars.